Growing vegetables in your home garden requires a certain amount of attention to soil condition and pH level. The pH level of soil can critically affect the growth of vegetables, allowing (or preventing) roots to take up sufficient nutrition for the production of the flowers and fruit. If you live in a region with acidic soil, selecting vegetables that thrive in acidic soil will bring you a better harvest. Eggplant will tolerate acidic soil. Potatoes (both Irish potatoes and sweet potatoes) prefer acidic soil conditions. The ideal pH range for this crop is 4.8 to 5.5, according to the Cornell University Vegetable Growing Guide. 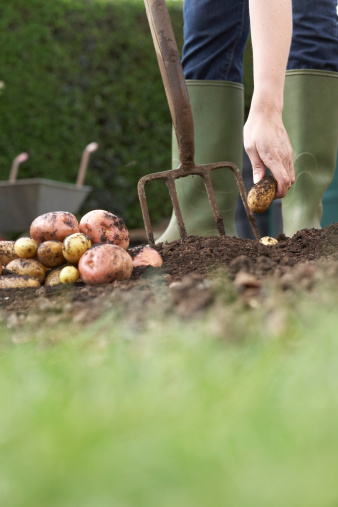 Potatoes need a light, loose, well-draining soil that is high in organic matter. To add nutrients and help aerate the soil, work in soil amendment such as peat moss, compost or manure at planting time. Avoid adding too much nitrogen-rich fertilizer, which will encourage the potato plants to grow foliage at the expense of tuber production. Eggplants also grow well in slightly acidic soil (pH level between 5.5 and 7.5). 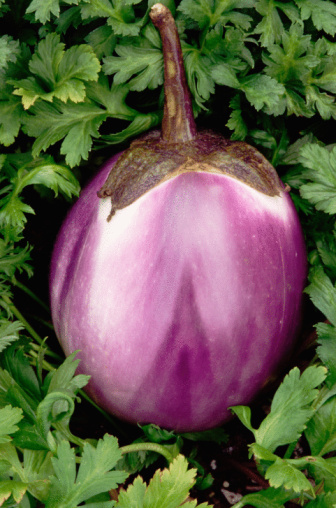 The eggplant is a heat-loving plant that requires full sun and frost-free temperatures. The crop will benefit from the addition of compost or manure to increase the amount of organic matter in the soil. Mulching plants helps to keep down weeds and retain moisture. Tomatoes prefer a slightly acidic soil with a pH range of 6.2 to 6.8, according to the University of Rhode Island Landscape Horticulture Program. A loamy, well-draining soil that is rich in organic matter will help tomato plants grow and produce. Tomatoes also benefit from the application of fertilizer that contains phosphorus, but fertilizer with too much nitrogen can inhibit fruit production. A 5-10-10 or 5-20-20 fertilizer is recommended. These numbers designate the percentages of nitrogen, phosphorus and potassium in the fertilizer formula. Nitrogen is always the first number in the formula, phosphorus is the second and potassium is the third. Green peppers can be grown in slightly acidic soil in the range of 6.0 to 6.8. They require well-draining soil with moderate fertility for best results. Peppers are warm season vegetables that will experience blossom drop if exposed to night temperatures below 60 degrees Fahrenheit. They will also suffer from poor fruiting if the blossoms develop into the fruit (called "fruit setting") when temperatures are above 80 degrees Fahrenheit during the day, according to Ohio State horticulturist Marianne Riofrio. Squash will grow in acidic soils with a pH range of 5.5 to 6.8, according to the University of Connecticut website. Add compost or manure at planting time to condition the soil and retain moisture. Mulching helps to control weeds that compete for nutrients with the squash plants. Do not mulch with grass clippings from lawns that have been treated with an herbicide. Kale prefers soil in the pH range of 6.0 to 7.0 for best growth, according to the University of Rhode Island Landscape Horticulture Program. Kale is a cool weather crop that prefers daytime temperatures of 65 to 80 degrees Fahrenheit. Mulching will help to keep roots cool and free of weeds.